I Can Barely Draw Staff Meeting — Complaint. A first man, a curly-haired woman, a second man, and a straight-haired woman, are seated at a table. The first man holds a document in his hands. On the table in front of him is what might be an envelope, with an address and a stamp on it. 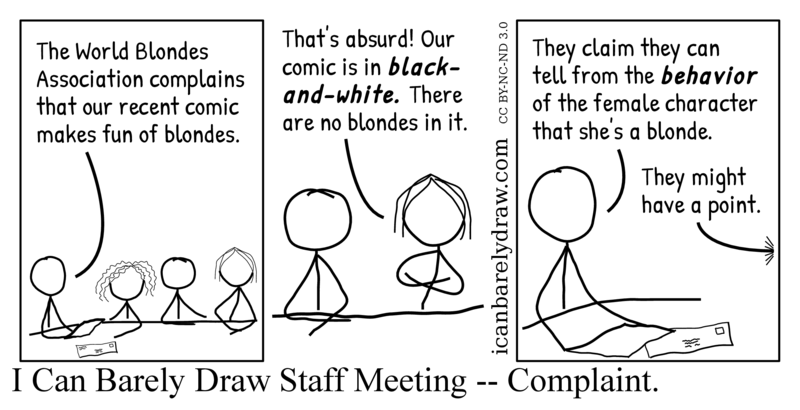 First man: The World Blondes Association complains that our recent comic makes fun of blondes. The next panel shows a more close-up view of the second man and the straight-haired woman. Straight-haired woman: That's absurd! Our comic is in black-and-white. There are no blondes in it. The third and final panel shows only the first man in a more close-up view. First man: They claim they can tell from the behavior of the female character that she's a blonde. Off-panel voice: They might have a point. Title: I Can Barely Draw Staff Meeting -- Complaint.